Many vintage airplanes, aerobatic planes, cropdusters and ultralights are taildraggers, which means there are a large number of pilots who need to learn these particular skills and techniques. 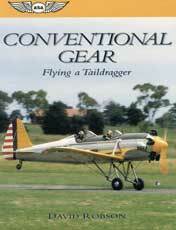 Written in plain language with many clear illustrations to explain the dynamics and techniques, book provides a thorough foundation of knowledge for the pilot seeking a tailwheel endorsement. 220 pgs, SB, 7 x 9, illustrated, indexed.